Studies show that communicating with someone in their native language dramatically increases their likelihood of making a purchase. Local content creates a better user experience. In-language content drives customer satisfaction. Translating your content maximizes your content ROI. 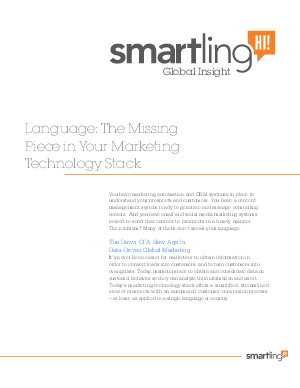 Download this white paper to learn about how Smartling’s cloud-based solution can simplify and accelerate your translation projects and enable your business to reach new markets quickly.